This is actually a pattern of one of my beloved pets. He recently earned his Canine Good Citizen Award. Testing was held at a local pet shop and he was such a good boy. Of course he didn't mind being fawned over by all of the ladies that stopped to pet him. He is truly a good citizen! I enjoy making patterns particularly of animals! 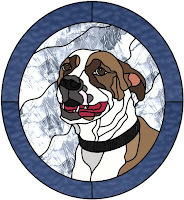 If you have one that you'd like to have commemorated in stained glass, or would like a pattern to do yourself, please feel free to contact me! 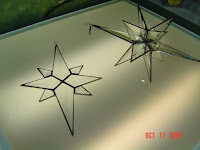 This star is being made for a friend to give as a gift to her sister. It's supposed to be representative in color to a Sunrise/Sunset. These interlocking stars are beautiful no matter what colors are used. It's being foiled as I speak. 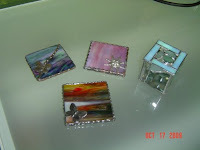 These are some of the Christmas Craft Fair items I made. I attended two shows before the holidays. They both turned out to be positive experiences for me, even though one of them was a first time event. 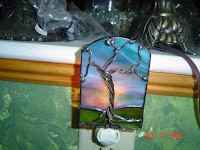 It was so nice to meet some of the other crafters and the connections you can make just by participating are heartwarming. I thoroughly enjoyed seeing old friends and making new friends and am thankful for the positive comments I received at both of these shows. Next work effort is to get some things ready for Spring/Summer..better get crackin! 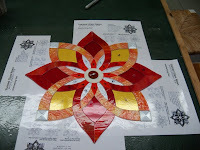 I've been working with stained glass for 20+ years or so. In the beginning I took a class through our local recreation department. That got me hooked! 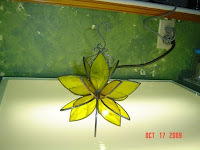 For awhile I made beautiful stained glass objects for my friends and family as gifts. After going through some life changes I decided that I needed to go back to my art. And now I have a beautiful shop/retail facility at my home. 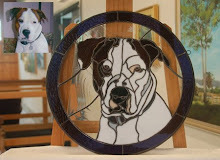 I teach classes and enjoy seeing how delighted my students are with their very first piece of stained glass. 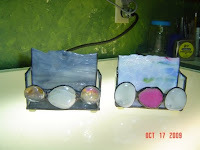 I have made a transition to designing my own patterns and am able to design and create some very intricate designs using Glass Eye 2000. I feel that I can design just about anything that a customer could want and truly enjoy creating something unique and unusual. 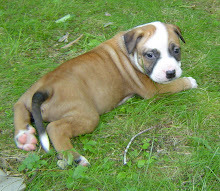 I hope that you enjoy your visit to my blog. 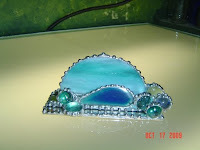 And if you are interested in classes or having something commissioned, please feel free to call me at 207.653.2245. This is a custom designed piece showing a customers much beloved Porsche 911. He wanted it to show speed and is a big fan of racing. He (and I) believe that we got it right!